He’s shipping out of Boston. Jim Salisbury of CSNPhilly.com is reporting the Phillies have an agreement with closer Jonathan Papelbon pending a physical. The deal is believed to be four years and close to $50 million with a vesting option for a fifth season. It would be a record package for a reliever. 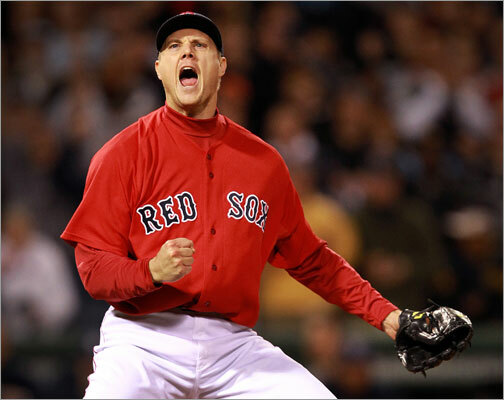 Papelbon was the greatest closer in Red Sox history, saving 219 games over seven seasons and seven more in the postseason. The hard-throwing righthander was a fan favorite, coming out of the bullpen in the ninth inning to glower at batters and almost invariably secure a victory. But unlike several of his teammates, Papelbon turned down the opportunity to sign a long-term contract with the Red Sox, going year to year with the goal of striking it big in free agency. He appears to have accomplished that. Papelbon, who turns 31 later this month, was a four-time All-Star and allowed only three earned runs in 27 postseason innings. All three of those runs came in Game 3 of the 2009 Division Series against the Angels at Fenway Park. The Red Sox have not been back in the postseason since. Papelbon dominated in the 2007 postseason, throwing 10.2 scoreless innings over seven appearances and helping the Red Sox to the World Series championship. In 26-year-old Daniel Bard, the Red Sox would appear to have a ready replacement. Bard has a 2.88 earned run average in 192 career appearance and has been the primary set-up man for the last two seasons. He has struck out 213 in 197 innings. Free agent closers include Ryan Madson (who the Phillies were negotiating to keep before turning to Papelbon) Joe Natham, Heath Bell, Francisco Rodriguez and Jonathan Broxton. But regardless of Bard’s potential or signing another closer, the loss of Papelbon is a significant one. The quirky righthander stood up to the pressures of the American League East and closing for a big-market team. He was the first pitcher in history with 35 or more saves in his first five full seasons. He was a free-spirit in the clubhouse, dubbing himself “Cinco Ocho” (his uniform number) and adopting what at times seemed like a second personality. In 2011, Papelbon converted 31 of 34 save opportunities and had a 2.33 ERA. But two of his blown saves came in the final nine days of the season and contributed to the team’s historic collapse. Papelbon was at his worst in Game 162 at Baltimore. Called on to protect a one-run lead, he got two quick outs before allowing two doubles and a single to lose the game and eliminate the Red Sox from the playoffs. He is the latest in a series of departures from the Red Sox. Manager Terry Francona left the team on Sept. 30 and general manager Theo Epstein resigned Oct. 21. Now Papelbon has joined the rush to the exit. Papelbon was a Type A free agent. Assuming free agent compensation rules stay the same under the new collective bargaining agreement being negotiated, the Red Sox would receive two first round draft picks in return for Papelbon.